The jury certainly didn’t need long to reach there verdict in this lengthy trial. 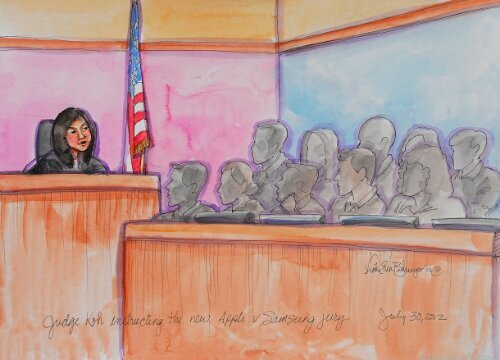 Well the verdict from Judge Lucy Koh’s California court room will enrage Android fans around the world. On Apple’s “pinch and zoom” ‘915 patent, the jury found that Samsung infringed on all but three products. For the “double-tap to zoom” ‘163 patent, the jury found that Samsung infringed on a wide number of products, but not all. On the question of whether Samsung’s infringement was willful, the jury again found for Apple on a number of patents and devices. Finally, the jury ruled that all of Apple’s patents are valid. Regarding trade dress, Apple has proven that its unregistered iPhone 3G trade dress was protectable, and the jury found that a number of Samsung phone models violated Apple’s trade dress, thought not all of them. I’m sure we can expect this not to be over and the appeal process to begin. Stay tuned for more updates as they come in. It has to be said this has been a bad day at the office for Samsung.